What are Combos & Super Abilities? Combos and Super Abilities will help you progress in the game. How do I make a Sunbeam and what does it do? When you line up 4 Crops in a row, you create a combo that gives one of those Crops the Sunbeam Super Ability. You can tell that a Crop has a Sunbeam when it glows brightly. Matching a Sunbeam Crop will harvest an entire row of Crops, either horizontally or vertically! Use Sunbeams wisely to score big points! What is a Barrel and how do I make one? Matching 5 Crops in a row creates a Barrel. Barrels are super powerful because you can harvest ALL of one type of Crop from the whole board, at once! For example, if you have a Barrel adjacent to a Strawberry, swapping the Barrel and the Strawberry will harvest EVERY Strawberry on the board. This is a huge asset on collection levels. Prized Crops sound awesome! How can I make some, and what do they do? A Crop turns into a Prized Crop whenever it is swapped into position to make an “L” or “T” shape of all one type of Crop. You can tell it's a Prized Crop by the ribbon it displays. Once a Crop becomes a Prized Crop, harvesting it will cause the Prized Crop to explode, harvesting all the Crops around it in a 3x3 area, then after new crops cascade in, the Prized Crop explodes AGAIN to harvest another 3x3 area of Crops. By golly, that's good! I can make a Crate? Great! But what is it, and why do I want one? 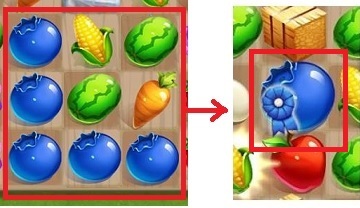 Matching crops in a 2x2, or square, pattern will create a Crate. 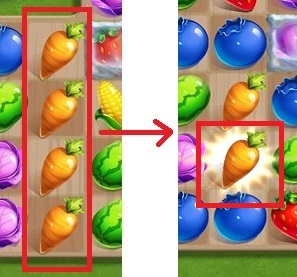 Crates do not cascade down the board like regular Crops. Instead, they stay in one spot on the board until you use them. To use a Crate, use your finger to drag a line starting on the Crate, and then through as many of one particular type of Crop as you can. You can keep dragging to make a longer and longer chain, as long as you're connecting the same type of Crop. You can drag vertically, horizontally, or diagonally. Once you've got as many Crops as you can, remove your finger and all of those Crops will be collected into the Crate and harvested. You can even chain multiple Crates together for truly MASSIVE chains! Can I make any other Combos? Heck yeah! If you've got two Supers (Sunbeam, Barrel, Prized Crop, Crate) side by side, swap them and see what happens! Combining Supers together results in some really incredible surprises! Try for as many as you can find!